Chain chokers are still a popular choice, especially in the eastern half of the United States. 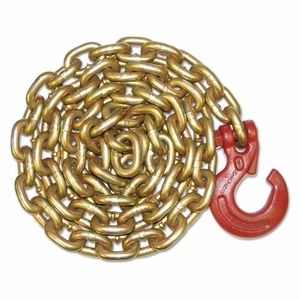 Chain is more durable than wire rope in terms of skidding and choking because it doesn't have fine outer wires that begin to break and fail, and that's why many like using it. Plus the chain secures well inside the specialized choker hook, so once it's in there, it won't fall out by accident. We offer these assemblies with either Grade 70 or Grade 100 chain and in a variety of lengths. Grade 70 Transport Chain is strong, plus it's tried and true in many industries all over the world. But if you want simply the strongest chain choker system, go with Grade 100 Alloy Chain--the same grade used for overhead lifting. Sure, the chain might be a little stronger than the hook, but it's likely to last a very long time. Maybe you already have some chain, or perhaps you have a complete chain choker system and you just need a few replacement parts. Look to the bottom of this page and you'll see all of our chain choker components offered individually. Grab Rod for Chain Chokers - 3/8" x 38"